I live in the Adirondack Mountains of New York state, near the Canadian border. I love drawing inspiration from vintage and ethnic jewelry. There is such a rich history behind human self-adornment, and I love contributing my own artistic voice to that history. Seed beads are, hands down, my favorite material to work with. I am continually amazed and inspired by the sizes, shapes and colors of seed beads, and I love the magic that comes from stitching these tiny little beads together into beaded cloth and jewelry. The piece was inspired by a piece of Byzantine jewelry that I saw in a museum exhibit. 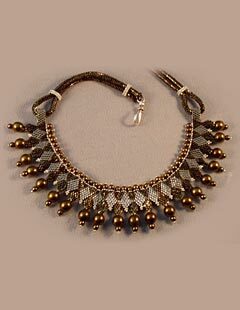 The original was made in solid gold, but I reworked it in two shades of Delica® seed beads and used Bali silver and Czech druk beads to mimic the details of the original. I had a vague idea of how to make the design, but when I started stitching, it seemed to take on a life of it's own! When I finished it, I knew I had something good. When I submitted it to Beadwork magazine for consideration, it wound up being on the cover of the issue in which it was published! I actually started making jewelry when I was a very small child. My mother, who was a knit and crochet designer and historian, would toss my sister and I a bag of buttons and some yarn and say, "Here, make something!" All through high school I made jewelry using a variety of materials including buttons, paper and clay. Then in college, I got bit by the bead bug. My mother gave me a pair of bead woven earrings, and I decided that I was going to teach myself how to do all those stitches! I had to take a class to learn peyote stitch, but other than that, I'm almost completely self-taught. I actually have a background in environmental science and geology, although I did spend a couple of semesters in college studying music therapy. I discovered Fire Mountain Gems and Beads a long, long time ago, when I first started reading Beadwork and Bead and Button magazines. Fire Mountain Gems is still my favorite source for Delica® seed beads! I play the piano and violin, and my husband and our toddler and I all love to go hiking, camping, fishing, cross-country skiing and ice skating. I don't belong to any formal beading societies or groups, although I have a small group of friends up here who all love beading. Jewelry-making started out as a way for me to decompress when I was working in the very stressful field of non-profit community development. Then I realized that I was spending more time thinking about my beads than I was about work! When I lost my job, I started doing some design work and had a few projects accepted by Beadwork magazine. Then when I had my son in January of 2008, my husband and I decided that I would make beadwork and jewelry-making my full-time job so that I could stay at home and raise our son. In June of 2009, I was hired to be the guide to beadwork for About.com, and I haven't looked back! Beading is my full-time career now, and I couldn't be happier! I sell my work on Etsy and during the summer months at local farmers' markets and craft shows. I'm starting to look into some of the high-end fine craft shows as a market for my work. I usually donate finished pieces of jewelry to both Meals on Wheels and my local PBS station as part of their annual fundraisers. I've also donated pieces to my local Association for the Prevention of Cruelty to Animals and to other local non-profit organizations. You can't go into the beading/jewelry business with the idea that competition is a bad thing. The market for handmade jewelry is so saturated that you really have to go into it with a positive attitude and with the belief that you can make your own opportunities. Look in unusual places for sales and shows where you can promote your work, and share your techniques and tips openly with other beaders and artists!